I tend to be a mellow person. Not super excitable. But I have to admit this week has been rather exhilarating in my little biz. 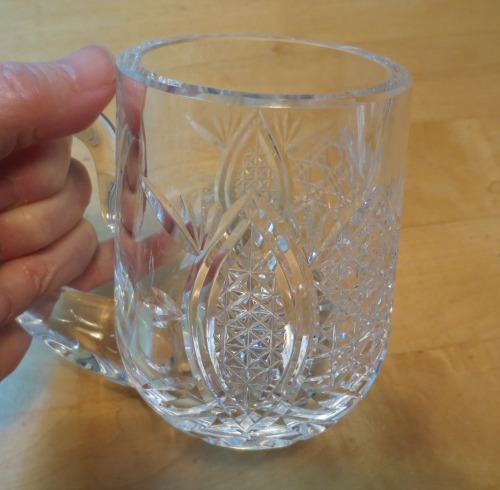 On Tuesday I popped into my local Goodwill on my way to buy plant mulch (not so exciting) and found a Waterford crystal mug (with the Waterford acid stamp on the bottom). This is the first time I’ve found Waterford at a thrift store. I’ve look it over (and over) checking for any damage, but find none. 🙂 They weren’t giving it away, but the price was fairly reasonable. 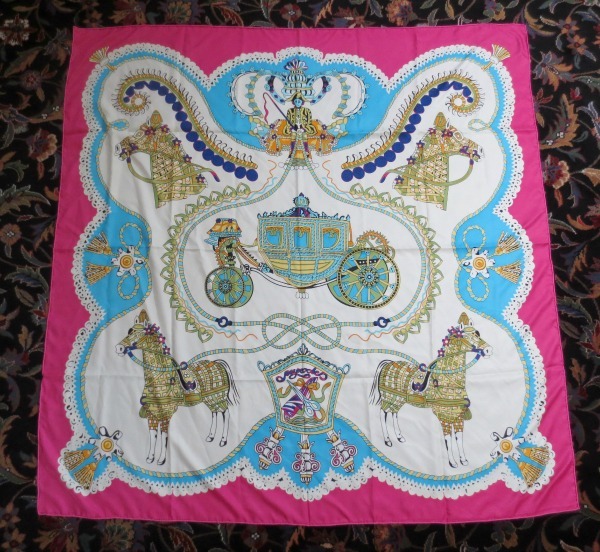 I also found a HUGE (50″ by 50″) French silk shawl with fanciful horses. 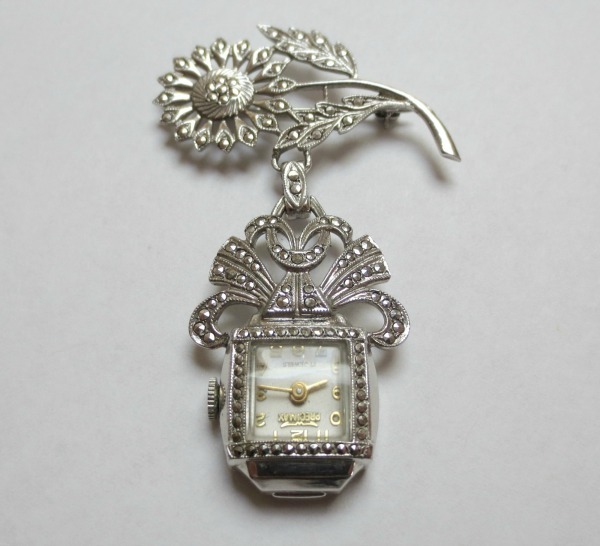 It is reminiscent of Hermes, though it isn’t, and thankfully it isn’t a knockoff. There is some fancy cursive lettering near the pair of scissors that might be the maker’s name, but I can’t quite figure out the letters. Ideas?? 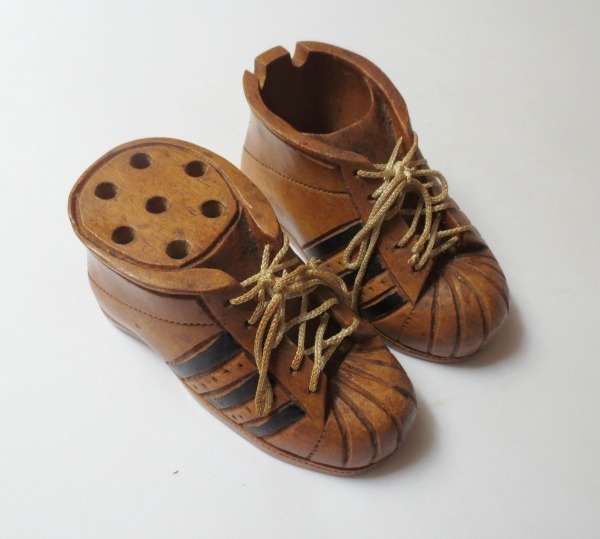 But my favorite find, hands down, is the ashtray and cigarette holder made of hand-carved wood in the shape of sneakers complete with laces! 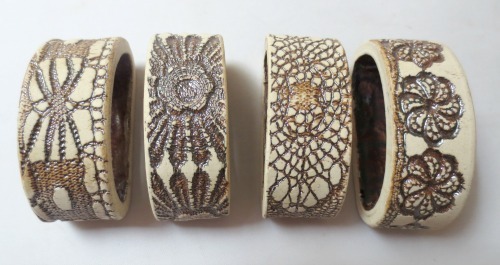 Finding something this quirky and fabulous and one-of-a-kind made me giddy. Now before heading home I dropped in on a friend and former co-worker. She had an intriguing project for me. She works as an archivist for an order of nuns. A couple of the deceased nuns had some costume jewelry and as the pieces have no historical value for the archives would I be interested in buying them?? You bet I would!! 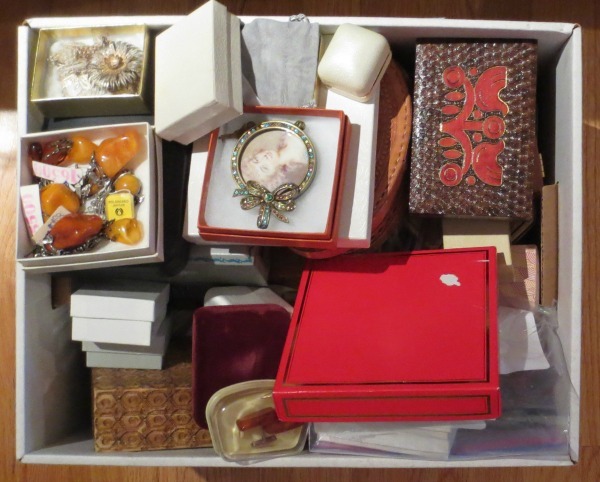 She let me take home a whole cardboard box full of bags and boxes of jewelry to sort through at my leisure. I love this kind of picking because it’s so fun and easy. I have plenty of time to examine items, research them, decide what I want to buy and set prices I’m willing to pay. The only fly in the ointment, one of the nuns had originally come from Poland, so any Polish items I find will have to be set aside to be returned to her family. Drat! 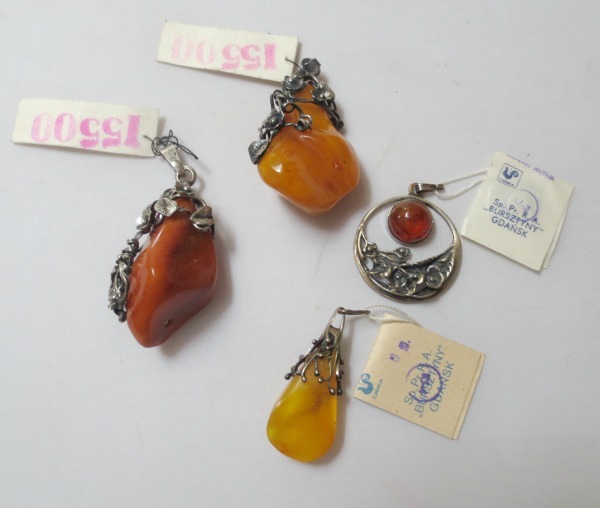 There is a ton of amber (definitely a Polish thing) and some pendants still sport tags that say Gdansk. Nevertheless, I’m still excited about going through the box. I’ve done a super quick pass and started to set aside some of the pieces I like, including some of the amber pieces though I may not be able to buy them. 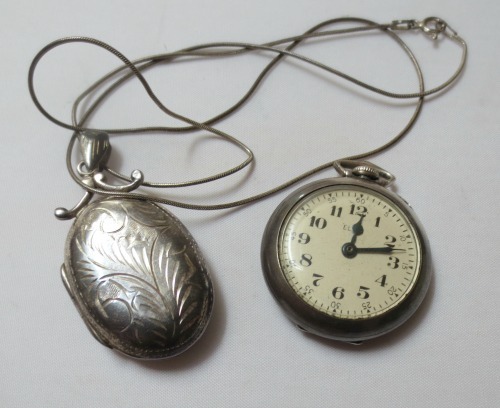 Here’s a ladies Elgin pocketwatch with sterling silver case and a silver locket I like. The weirdest thing I found? 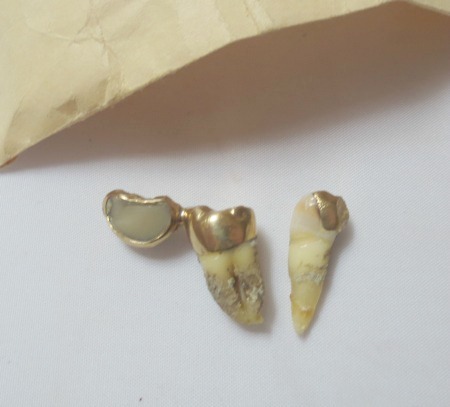 I emptied a little brown envelope into my hands and found myself holding someone’s gold-capped teeth! Honestly I would sell these as an oddity, but I think the nuns would profit more by taking them to one of those places that buys gold. So for the rest of this week I’ll be working through the box and figuring out what I want to buy, what should be donated and what should return to the nun’s family. A fun project for sure. Hope your week has been exciting too! What fun you are having! Wish I could tag along but Arkansas is a little out of the way.